That looked really tiny, but then I realized I had this thing zoomed far out. You can see it in full at this link always. Lucha Azteca 7 Elite is worth watching for Carisitco/Volador alone. It’s actually listed as going 15 minutes past the hour again, so that may be the regular thing. The second part of Rey de Reyes will air. Psycho/Wagner will have a match live on Friday, and a different match of theirs will air Saturday. 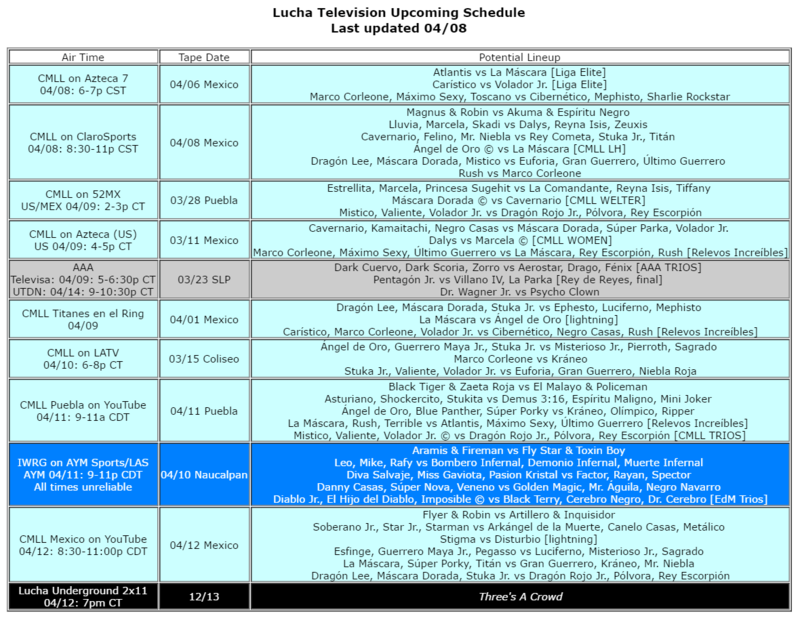 The TV version of Dorada/Cavernario from Puebla will air on 52MX. The preview of Lucha Underground mentions Puma, Rey and Dragon in action, the Medallions back in play, and a new name debuting. What happened: Bobby Lashely & Mascara Dorada got the first two wins in the Liga Elite tournament. Caristico & Atlantis lost to Volador & Mascara via cheating, setting up singles matches next week. What was good: Dorada/Tiger was the match of the night, and the others are worth checking out. Where can I watch it: They’ll be in my playlist on Tuesday. A very long red carpet sequence of random people – some people in the tournament, some very random folks – kills off six minutes of the show. Everyone in Liga Elite has new Elite specific entrance videos. The arena is more lit than usual, showing the ringside fans. There’s a floor camera person who’s either just on the other side of the barrier or hanging close to it – you can‘t see him in most of the shots, and no photographers are allowed close to the ring. Match seem to be edited slightly. They’re at least cutting form the end of the entrances to the some seconds into the match, and there seems to be slight editing in the match. Notes: Lashley’s name is spelled “Boby”. Edgar is referee. Rush is the rudo in the match. Review: [good] entertaining enough when they were throwing each other around, and Rush was a good first opponent for Lashley to have that kind of match. (Lashley against some of these other guys might not go so well.) Lashley didn’t look super, but looked different enough and the point of an outsider is to be different. Rush getting the visual pinfall, giving it up to walk into the finish is not a great sign, and then walking around to show he was really ok after the match is not a good sign for the compromises they’ll have to make, but at least it was clear they were setting that spot up during the match on the rewatch. Rush made sure to argue Edgar before hand. Can’t as easily explain why Lashlely hurried to the back instead of celebrating. Senorita Cometa, a Japanese woman, tried to interview people in Japanese before and during the next match. This was not good. Match 3: Atlantis, Carístico, Mistico vs La Máscara, Último Guerrero, Volador Jr.
Notes: Volador, acting like a rudo, unmasked Caristico after the match and challenged him to a mask versus hair match. La Mascara challenged Atlantis. Caristico challenged Volador right back. The announcers revealed those two singles matches, as part of Liga Elite and not with the stipulations, would take place next week. Review: [good] the short format of the matches on the show hurt this one the most, as the first two falls were reduced to almost nothing. If they’re going to keep the TV format the same as it, they need to make all the TV matches one fall. The rhythm of the match picked up in the third fall and these guys continued the pattern of working very hard at a fast pace. La Mascara being unable to follow Atlantis because he’s facing the wrong way was good unintentional funny. Sangre Azteca left the match with a leg ankle injury. Vaquero took 2/3 to win Espectrum’s hair. Tecnicos took 2/3, the last when Cibernetico and UG had issues. That sets up a singles match next week. Attendance here looked the biggest in years. It’s hard to see Vaquero/Espectrum being a big deal, so it seems like the combination of billing the show as Homenaje a Dos Leyendas and the names in the main event make a difference. Magno’s debut; he was stretchered after taking Dragon Lee’s headscissors off the apron. Argos fouled and unmasked Dragon Lee for the DQ. Toscano’s return. Rockster replaced Casas. Tecnicos took 1/3. Mystery people watched the show from the first row, which turned out to be LA Park & his son. They got into argument, then a fight with Cibernetico, causing the Hell Brothers to lose. LA Park came in the ring and cut a promo on Cibernetico after the match. Later, he insisted he wasn’t signed to Elite and had just bought a ticket. Caristico won with La Mistica in a high spot match. Caristico is 1-0 (3), Volador is 0-1 (0). Money thrown in. This war may just be starting between Elite & AAA. LA Park and Dr. Wagner are forever connected, and LA Park repeatedly mentioned Dr. Wagner in his post match promo. Park said his last two goals in lucha libre are to unmask Wagner and shave Rush. Wagner is currently scheduled to challenge for Psycho Clown’s Latin American championship on Friday night. It’d be very difficult to trust Wagner with an AAA title given he’s got a clear path to jump to Elite, but he’s also a hard guy to beat. It’s also hard to figure out how LA Park manages to stay in Elite for the length of tournament. He got kicked out of CMLL in three weeks. He’s show a willingness to walk out promotions when he doesn’t like how he’s being used, and he seems to be in a tournament where he’d be asked to lose a few times. The Rush/Lashley finish showed Elite’s willingness to have some silly endings to protect people, but I’m not sure if that’s enough. Park repeatedly said he didn’t sign a contract, and – the way things are going – that’s believable. Attendance or the big matches didn’t seem to be helped at all by the first week of TV. It was more or less the same it has been. It’d be hard for Elite to move back to Sundays, since that would cost them the away from Mexico City shows they’ve been working, but I suspect the Wednesday day is going to be first thing blamed. Magno seemed to be relatively OK after the show. Earlier, Magno said he learned from his WWE experience, but agreed with the decision to cut him and was happy to go back to Juarez. He only wrestled six matches in eleven months there. Filming has started on the Blue Demon TV series. Tenoch Huerta is playing Blue Demon (Sr.), and the article head says he’s training with Canek. That doesn’t seem like the best pick. Notable, Huerta says he and the director hasn’t talked to Blue Demon Jr. – Demon was teasing he was going to file a lawsuit over this show (which will be a fictional take on Blue Demon) but hasn’t said much about it lately. They’ve casted Demon’s wife, Demon’s teacher, as well as Black Shadow & his wife. No mention of Santo, who kind of needs to be in a Demon story but would also prevent legal issues. No mention of when this will start airing, but they do say it’ll air on Sony’s Blim platform. On the Bauer & Pollock podcast, Court Bauer says the AAA in English in Canada show is currently a ‘soft launch’ and they’re hoping to be closer to real time in May. That’s the explanation of why it hasn’t been promoted at all, although the underlining problems (announcers have no idea what’s going on, actual AAA shows haven’t been so hot) aren’t going to be helped by it being more current. Real time probably doesn’t matter for AAA unless they’re going to start doing iPPVs again. Felina Metalica & Reina Dorada talk up their match in Gimnasio Hercules on Saturday. Metalica is unconcerned, saying she always beats Dorada. Demus looks back at his feud with Yoruba, notes that he actually was Yoruba’s trainer, and hypes their tag match on the same 04/09 Gimnasio Hercules show. Joe Lider talks about his match on Friday. Eric Mutter writes about Dr. Wagner Jr. and previews tomorrow’s CMLL show. 1) Kanon & Zatura vs Picudo Jr. & Violencia Jr.
First defense, rematch against ex-champions. Golden Magic appears to be a rudo in IWRG now for whatever reason. I’m sure Demonio & Muerte have had other identities in IWRG but haven’t figured out which one yet. Second match is billed as school vs school, but the rudos the Kriminal Boys so you kind of wish they got Alas de Acero or Iron Boy to team with Aramis. What happened: Dr. Wagner got the better of Psycho Clown again and wants a title match. Mesias and Texano argued a bit. Villano, Parka and Pentagon didn’t get along going into Rey de Reyes. Ricky Marvin returned (?) as a rudo, lost, and was no help when Chessman & Averno got beat up by the Perros del Mal post match. What was good: I liked the second match. Skip the rest. Where can I watch it: It’s on AAA’s channel. Previously: Octagon Jr. debuted, lost to Pentagon. Xinetez beat Psycho Circus. Mesias won the bull terrier match. Notes: This match did not air on the national broadcast. Faby challenges Taya to a title match right there. Taya just insults Faby and runs. 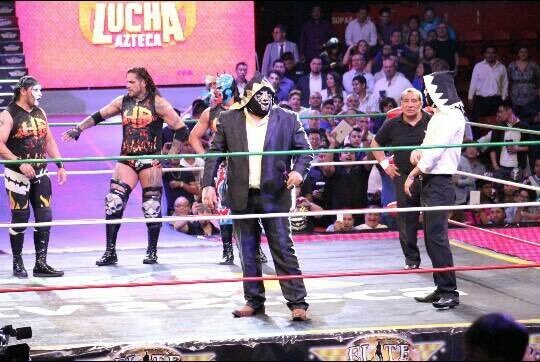 Review: [ok] Even shorter than last week’s match – shorter than the time listed, because the first minutes was the rudos annoying the técnicos by not fighting – but less comedy and more action. It’s still nothing you need to see and it totally took me off guard how short. (It’s so much shorter than usual that it’s clearly edited a bunch, and there’s other hints of that as well.) I’m not sure I would’ve gotten more out of it with more time, so I’m not even sure what I’m talking about. Review: [good] so sad for Averno – he finally connects on the swandive headbutt, naturally he thinks he’s going to win, and then Ricky blows it for them. I hope he made Marvin give back the shirt. This felt like a match which could’ve been a lot more with more time. The opening and the rudo sections felt rushed to get to the late part of the match, but I liked enough of the late part to give in a strong grade. Marvin wasn’t here to do much beside take the técnicos best shots, but he was up for a reverse huracanrana among other things, and looked better as Marvin than he had of late as Bengala. Crowd had much less problem with Octagon Jr. away from Pentagon JR.
Notes: Villano and Pentagon jumped Taurus, but started to have problems with each other after the técnicos made their comeback. Pentagon attacked Parka after the finish, and told both Parka and Villano he was winning at Rey de Reyes, and randomly said he was taking Jack Evans hair next. The Jack challenge just seemed thrown out there with not much to it. Review: [ok] This was the opposite of the last match, really slowing down after the first half and dragging a bit thru the one on ones. Garza and Parka were really over with this crowd, before even doing anything. (This is a good thing, they weren’t doing much which would’ve impressed.) Garza pinning Taurus and it being immediately ignored to do Rey de Reyes promos makes one wonder why the finish didn’t set up Rey de Reyes, or how much AAA is even thinking about any of this stuff. weird Xinetez vignettes with marching military men – are they supposed to be fascists? Match 4: Monsther Clown, Murder Clown, Psycho Clown vs Dr. Wagner Jr., El Mesías, Texano Jr.
Notes: Rudos jump técnicos again. They forget to blow the opening whistle. Psycho rips up Wanger’s mask, Wagner wears a black mask under it for a while, then later has a third new mask. It’s kind of amazing. Texano hits Mesias with the lasso once about 12 minutes in, and Mesias repays it with a not so accidental slap. They start fighting, which kills the crowd, and the Clowns take them out. Wagner tells Psycho he wants a title match. (Mesias and Texano argue in the background and then disappear.) Psycho tries to responds, Wagner attacks him and gets Psycho’s mask. The rest of the Psycho Circus are too slow. Review: [ok] Technically OK match Felt like a house show Psycho Circus match, with a little extra emphasis on Wagner/Psycho, but a lot of things we’ve seen two hundred times. The last minute or so of Psycho/Wagner was good, but it took a lot of time to get there. Wagner winning completely clean is amazing given the hype for the match should be about Psycho Clown having a chance to win, and this is very clear that he does not. Mesias and Texano continued their role as secondary figures in all of this; there’s surely going to be a great story that’ll come out about this one day. Murder Clown’s decisions to sell and not sell seem to be completely random.